One size does not fit all! I mold my style to help you accomplish your buying goals. I make sure you have access to listings whenever you want them, I will help you find the best mortgage program for you and I will help you find an attorney, building inspector, tradesperson and any other service you need. When it comes to where you live, I will help you evaluate the areas, give you information about schools and help you find the services you need to make your new house a home! If you would like to look at property or find some preliminary information please don’t hesitate to call me me at 847-370-5065 or contact me online. I will get back to you as fast as a cheetah. I would love the opportunity to assist you in making the process as smooth and effortless as possible and turn your Dreams into Reality! Specializing In Working with Investors…. Rehab Specials, Multi Units 2+, Condo Conversions, Water Front, Second Homes, and just Good Deals! I have been Certified and Trained with New Construction. Naomi is one of the best realtor’s that I have ever worked with. I have done business with her on a personal and professional level. She does what ever it takes to do what is best for her client. I have never met anyone else who works as hard for their client and who always has the clients best interest at heart. As a loan officer I met many realtors but none are like Naomi. She is one of a kind. Ok maybe you have done this once or twice, maybe more! But NOW you have decided that there is something NOW you are looking for that you don’t have. Let me help you find what it is that is your “ IT” or your “NOW”. Have you become an Empty Nester? Is the home just too much to handle? Do you just want one level? Have you decided that outside Maintenance is not for you? Let me help explore all your Options! Relocation, Or Are YOU Relocating?…. 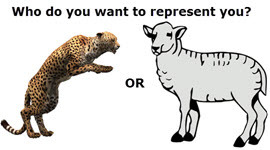 Checklist for choosing an agent- Think about it do you want a cheetah or a lamb representing you?